Rahmin Bahrani's Goodbye Solo (Roadside, 3.23), which will be showing at this weekend's SXSW film festival in Austin, Texas, is a thing of great and delicate beauty. And I say this not just because the film's two key locations (Winston-Salem and Blowing Rock, NC) are the two areas I consider home, but because I'm a lover of great filmmaking. I will be publishing a full review closer to its showing at the festival, but I just wanted to go on record as saying how much I love this film. Not only does it hold a special place in my heart because of its roots, but because of its simple and moving story. Bahrani has been an exciting up and coming filmmaker with films such as Man Push Cart and Chop Shop, but this is his crowning achievement so far, a tender and emotionally grounded piece of work. For people who live in New York or Los Angeles, seeing your hometown on screen isn't that big of a deal. But both of the places depicted in Goodbye Solo are very near and dear to my heart. 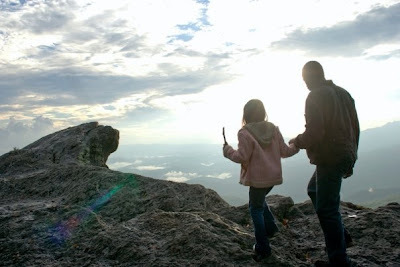 I have always considered Winston-Salem my home town, and I've spent the last four and a half years at Appalachian State University in Boone, which connects with Blowing Rock. The Winston scenes were all extremely familiar (I've seen many a movie at the Marketplace Cinema, which plays a key role in the film), but when they cross under the stone bridge where the Blue Ridge Parkway crosses Highway 421 (a bridge I go under every time I head home...that bridge means 10 more minutes to Boone) to herald their arrival in the mountains, my heart skipped a beat. It's like a love letter to the North Carolina mountains, and I must admit they have never been more breathtaking. Bahrani has captured their spirit, and for that I commend him. It's a really good film, I agree, even though I don't have the same ties to the landscape. But, like you said, it's 'great filmmaking' nonetheless. I was annoyed Luke missed it in Toronto, definitely one of the highlights for me. Anxious to see it. Hoping this one's at Provincetown Fest, fingers crossed. I was lucky enough to be in NYC for a business trip and was able to catch this at the MoMA where they were holding a 4 or 5 night Retrospective on Ramin Bahrani and had Goodbye Solo and his other films Chop Shop and Man Push Cart. I rented the other two films last year, and have become a fan. Seeing this movie on the big screen I was blown away. I now wish I could see the other two in the theater as well. The place was packed, and Mr. Bahrani and the cast were there for a Q&A which was really interesting. As a side note, and speaking of Man Push Cart, I finally saw the Wrestler a few weeks ago - is it me, or did The Wrestler just remake Man Push Cart scene for scene? Except of course the part where we listen to M. Rourke give his speech at the end explaining to the audience what the movie is about, and if you don't get that, Springsteen sings it to you as you leave - seriously! What was that? 2005: "Hey, don't I know you? I've seen you before...You're Ahmad, the Bono of Lahor" 2008: "Hey, you're so familiar..How do I know you? I've seen you before...You're the Ram!" I saw it in Portland! Loved the film, especially Solo's duaghter (or step daughter?). She was so smart and cute.